For years, the U.S. Army Corps of Engineers has studied how best to protect Houston from deadly hurricane storm surge. It will announce which one it thinks is best later this month. As promised, some of the Army Corps’ proposals borrow from dueling storm surge protection plans that scientists at Texas A&M at Galveston and Rice University unveiled years ago, shortly after Hurricane Ike in 2008. (A&M’s plan calls for a coastal spine, often referred to as the Ike Dike; Rice’s for a massive navigation gate.) Those researchers have consistently warned that Ike — already one of the costliest storms in U.S. history — could have sent a crippling storm surge into coastal communities and the port if it hadn’t shifted at the last minute. The quasi-governmental Gulf Coast Community Protection and Recovery District — a six-county coalition formed in the wake of Ike to study storm protection strategies for the upper Texas coast — also recommended a coastal spine-style plan in June 2016. “We have regularly engaged with the GCCPRD, Texas A&M, and Rice as our study has progressed, and have folded their designs, data, and analysis into our study,” Burks-Copes said. The Army Corps also has suggested six other projects to restore ecosystems across the Texas coast that act as natural barriers to storm surge. The “tentatively selected plan” the Army Corps will announce later this month will include one of the four Houston-specific protection plans and one of the six ecosystem restoration projects. The Army Corps estimates that the cost of the recommended plan will range between $22 billion and $30 billion. The Houston-area barrier may cost as much as $17 billion with the rest going toward ecosystem restoration projects. Members of the public — even those living outside Texas — will have until Jan. 9 to weigh in on the Army Corps’ chosen plan. Six public meetings are in the works, although the Army Corps also plans to take feedback online and via mail. 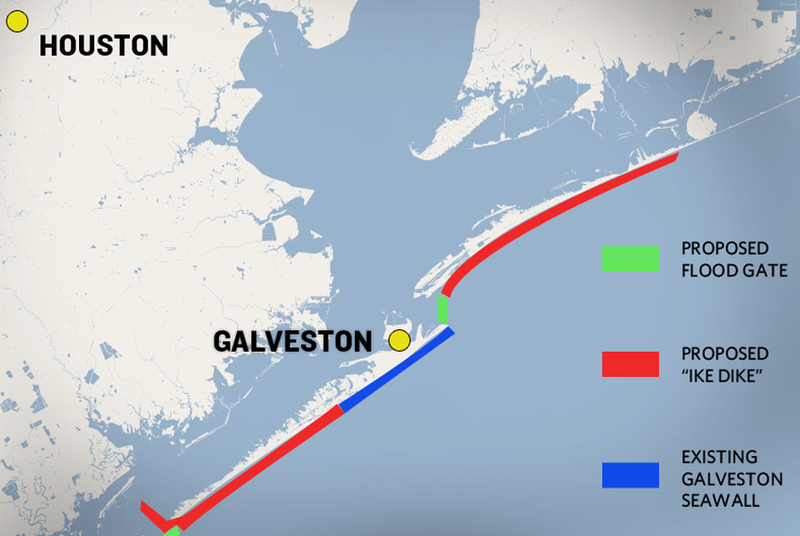 Three meetings will be held in the Houston-Galveston area, the others in communities further down the coast that would be impacted by the ecosystem restorations projects. The Army Corps may tweak the plan based on public feedback, Burks-Copes said. The final version is expected to be complete by 2021, when it will be eligible for funding by Congress. How soon that could happen is anyone’s guess given the uncertainty of politics, though several members of Texas’ congressional delegation — including Sen. John Cornyn, a Republican — have championed the cause. In July, the Trump administration announced that Texas would receive more than $5 billion for a range of flood control projects and studies, including $1.9 million for the Army Corps-General Land Office study. The bulk of the funding — nearly $4 billion — will go toward the construction of nearly 27 miles of coastal levees in southern Orange County and to shore up nearly 30 miles of existing coastal levees in Port Arthur and Freeport. “If we don’t get all the money we need, we have to separate pieces and parts out and build them as separable elements,” she said. “If it was a perfect world,” she added, construction would begin in 2025 and conclude in 2035.